Enjoy easy Beach access from "Bonnie Dune" our cottage on Little Lagoon! 2Bed/2Bath, Sleeps 6, Waterfront, Gulf Access, Boat Launch, Dock, Pet Friendly! Water views from every room in the HOUSE. Front and back decks for sunbathing or just relaxing and watching the sunrise and sunsets! Fish from the dock or bring your boat and launch it on the private boat ramp. Relax in the fenced yard under palm trees with your toes in the sand. 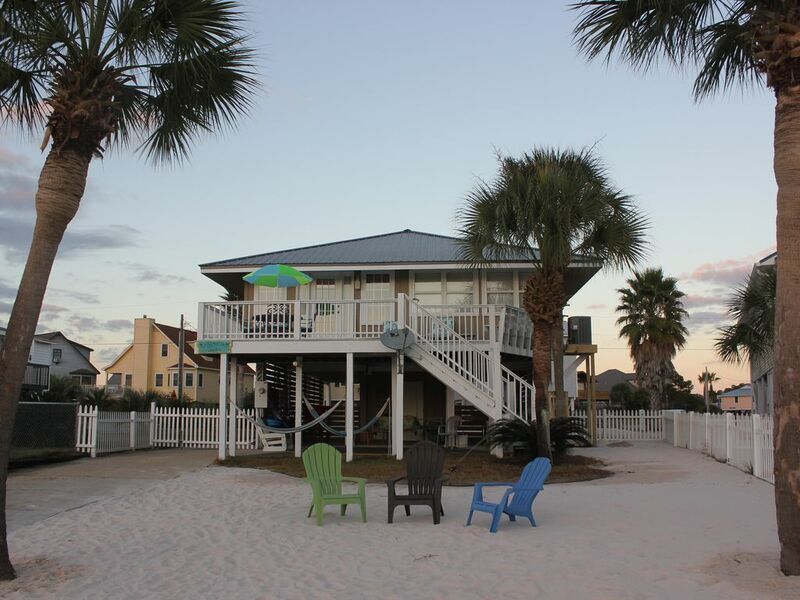 The beautiful, white sandy beach of the Gulf is just a short walk away!! Pier 33 is conveniently one block away for groceries or other necessities. The Hangout is just under a mile down the beach!! "Bonnie Dune" is a very easy, comfortable, fun home and property. Our search for a beach home ended when we first walked in the door and now we are excited to share it with you. We hope you have many memorable times here! We were married in 1982 and have 5 children aged from 10 to 29. We love to travel and have lived in many areas of the US from DC to Seattle. Currently we live in the Rocky Mountain region and although it is beautiful we often long for the warm weather and ocean. Our youngest daughter enjoys being here so much it is rejuvenating for us to watch her frolic in the water, waves and sand. We have always loved hosting friends, family, our kid's friends, and often new friends we only just met. There is always someone coming or going at our current home so we are very happy to have you as a guest at our new beach house! With retirement looming, we became more and more interested in spending time enjoying the beach so we started looking for the "ideal" location. We have traveled to some of the greatest beaches in the world including Australia, New Zealand, Hawaii, and both coasts of the US. In our opinion, Gulf Shores beaches rival them all. The clean, white sand and sparkling clear water are outstanding; we felt at home the day we drove into town. It was love at first sight when we walked into this little cottage on Little Lagoon. It was just right for us. The location could not be better, close to the beach, yet on the water allowing the "best of both worlds". It is quiet and peaceful, yet there is lots of activity nearby. You can relax and do nothing, or be as active as you want. The house is great for quiet time alone but also is perfect for socializing with friends and family. This house definitely has unique benefits. The biggest one is the location. The water view is great but knowing you have direct access to enjoy the water takes the experience to a whole new level! The Lagoon offers almost every water activity possible, from sailing to fishing and jet skiing to paddle boarding. Kayak in the early morning and then head to the beach after breakfast. Several guests have commented how much they appreciate the flexibility of enjoying the sandy back yard and lagoon on days when the beach may be windy or stormy. It is very convenient to not have to scramble off the beach in case of a sudden thunderstorm. The neighborhood is quiet and there is no thru-traffic. The neighbors are very friendly and there is a strong sense of community. There is so much within walking distance making shopping, restaurants, rentals, entertainment and of course the beach, all very convenient. Also, West Beach Blvd is very accessible for those times you want to travel by car. Showers in both Bathrooms. No Tubs in the house. Just 1 - 2 miles to any part of Gulf Shores! Downtown is relaxed yet bustling with activity. There are concerts, festivals, shops, rentals, restaurants, activities, parades, snacks, and sightseeing. Just a short 4 min. walk to the white sandy beaches of the Gulf of Mexico! You will walk right past "Pier 33" (local grocery & convenience store) on your way. This is a "Tier 2" property. It is 480 steps from our front porch to the sandy beach! Backyard is situated directly on Little Lagoon. The Lagoon has a sandy bottom which makes it great for wading, swimming, canoeing, kayaking, boating, jet skiing, wind-surfing, and other water sports. The water is magnetic, continually drawing your eyes to it. The serenity gives you a peaceful, easy feeling. The moon's reflection in the dark watery expanse is romantic and magnificent! The backyard has a private dock and boat ramp to launch your boat or other watercraft. You can fish for flounder, white and speckled trout, and redfish. Little Lagoon is private, peaceful and quiet. Central AC. Brand new compressor unit installed in 2018. Internet thermostat (can be manually overridden for your comfort). Central forced air heat. Brand new unit installed in 2018. Internet thermostat (can be manually overridden for your comfort ). Fully equipped with luxurious 200+ thread count 100% Egyptian cotton sheet sets. Linens are laundered professionally and exchanged between each guest stay. Stackable washer/dryer combo unit for your use. Park up to 3 cars in the front of the house. Wireless Internet. See login information in the welcome letter or the on-site guest book. Fully equipped with luxurious 100% Egyptian cotton towels. Please do not use the house towels at the beach. Comfortably decorated with sectional sofa. Large picture windows provide lots of light and great water views! 37" flat screen TV, DVD, DirecTV and stereo for entertainment. Jenn Air Stainless Steel fridge with ice maker/water dispenser. Jenn Air Stainless Steel gas range with downdraft fan. Sorry, there are no pantry (food) items left in the house between guests. Pots, pans, mixing bowels, dishtowels, silverware, serving utensils. Jenn Air Stainless Steel appliances. Blender and mixer in addition to other appliances listed here. Seating at the dining room table for 6. The island bar seats 3 on barstools. Flat screen TV in the living room, and each bedroom. DirecTV is the satellite provider and there are HD receivers in the Living room and both bedrooms. AM/FM/CD/cassette stereo located in the wall unit. There is also an AM/FM/Bluetooth enabled receiver by the Living Room TV with speaker pairs on the deck and patio. There is a DVD player in both the Living room and in the Master Bedroom. A few books are located in the entertainment center. There are some paperback novels (for rainy days) and coloring books for kids. Small selection of some of our personal DVD's are located in the entertainment center (wall unit). The yard has grassy areas and a sandy "beach" area with a few mature palm trees. Upper decks at both the front and rear of the house. Little Lagoon is the perfect spot for Kayaking or Canoeing! Bring your own or rent in Gulf Shores! You can launch your boat (up to 26') from the back yard on your private boat ramp. Tie up at the dock after a day of fishing on Little Lagoon. There are many charter trips or rental boats as well. There are decks on both ends of the house (facing East and West). The rear deck has a patio table and umbrella and chairs. On a calm night, you can hear the waves at the beach. There are many rentals for water sports gear but perhaps the most convenient is Ike's Beach Services located about 3 min walk from the property. They have Kayaks, Paddle Boards, Fat Bikes and more! Gulf Shores offers a mixture of signature courses with designer names like, Arnold Palmer, Jerry Pate and Earl Stone. The courses offer some magnificent topography and unforgettable views! Traveler's insurance is available via CSA's "Guest Protect Plan". The plan costs 6.95% of your total vacation cost. Details can be found at the following link: "www.vacationrentalinsurance.com/330CERT"
Great location but cleanliness of the house leaves a lot of room for improvement. Only 2 half rolls of toilet paper in the whole house. This could be a superb place to stay with some improvement in cleaning and maintenance. Fantastic place to stay, relax and unwind. David had everything we needed. Clean and inviting. Had a very relaxing visit!!! Loved sitting on the dock and the back deck at night looking at the water. The manager of the place was very friendly and informative about the area and were to go eat. Over all we had a great time and very much would love to come back for another visit!! Thank you for your review. It was a pleasure having you stay and we're glad you had such a great, and relaxing time! We look forward to seeing you again! The view from the rear deck is very relaxing and the night time view is beautiful with the lights from the surrounding area. It felt very homey, we had everything we needed. We will definitely consider coming back as soon as we can. It made our vacation complete. We are so glad that you had a great vacation and that Bonnie Dune made it so enjoyable for you. We absolutely love spending evenings on the back deck too! We hope you are able to make it back again very soon! Sorry about the weather but we are so glad you had a great visit in spite of it. We look forward to having you again! This was our second trip to Gulf Shores so we already knew we would love it. The house was great! I think everyone loved relaxing on the back porch and listening to music in the evenings l.
My boys loved fishing off the dock and we liked how close the walk to the beach was. The one and only con was the mattress in the master bedroom. That would not stop us from staying there again. Thank you for sharing your family’s house so my family could enjoy our week there and make memories! Thanks for your comments and we are glad you enjoyed your stay! The memory foam mattress in the master bedroom is not to everyone's liking and will be replaced in the coming year. We look forward to having you stay again in the future! Gulf Shores boasts white sandy beaches accentuated by the emerald green waters of the Gulf of Mexico. Although the beaches are fabulous, there are many other attractions and activities in the area. Gulf Shores has festivals throughout the year that celebrate history, music, food and the arts. Every May, Gulf Shores hosts the Hangout Beach Music & Arts Festival, which features more than 60 bands performing on four stages. The profits from this event benefit coastal protection and restoration programs. In October, the four-day National Shrimp Festival brings together more than 300 vendors selling arts and crafts and has two music stages and a Children’s Activity Village. Guests can enjoy plenty of shrimp and other seafood dishes. In addition to the parks that you can explore as a family, Gulf Shores has several attractions that are popular with children. Pirate's Island Adventure Golf has two 18-hole miniature golf courses with waterfalls, caves and a pirate ship. The Track Family Recreation Center consists of a video arcade, bumper cars and boats, miniature golf and bungee jumping. Its Kids Country section contains rides for small children: kiddie carts, spin tops, swings, a carousel and the Rio Grande Train. State parks and nature preserves in Gulf Shores feature trails and education programs about local wildlife and conservation. The city also offers saltwater and freshwater fishing opportunities. The 7,000-acre Bon Secour National Wildlife Refuge includes beaches, sand dunes, swamps and fresh and saltwater marshes. The park is home to red foxes, armadillos, endangered sea turtles, seven hummingbird species and more than 370 migratory bird species. It also has a picnic area. Gulf Shores Yacht Club & Marina provides chartered fishing trips on the Gulf, along with boat slips, bait shops and a restaurant. Gulf Shores features historic sites and museums that showcase the fine arts. Fort Morgan played an important role in four wars: the Civil War, the Spanish-American War, World War I and World War II. The fort offers living history programs that interpret these wars, as well as an event commemorating the 1864 Battle of Mobile Bay. Tino’s Fine Art & Frames showcases work by local artists, including mosaics, pottery and prints. The City of Gulf Shores operates parks with tennis courts, picnic areas, indoor pools, skate parks and soccer fields. The city has more than 10 golf courses available for public use. The 12-acre Meyer Park in downtown Gulf Shores has playground equipment, a baseball diamond and horseshoe pits. Three miles from the coast, the 870-acre Craft Farms Golf Resort has two 18-hole Arnold Palmer golf courses with rolling fairways surrounded by lakes. Area resorts provide stay-and-play packages. The 29th edition of the Gulf Shores Entertainment Series will feature 12 shows from six different acts ranging from Grammy Award winners and multi-platinum artists to tribute bands and spectacular performances. Performances will be held at the Erie H. Meyer Civic Center in Gulf Shores on weekends throughout January and February. ~Annual National Shrimp Festival - October. ~Annual Oyster Cook Off at The Hangout - November.